After a divisive presidential election, Georgia State students and Atlanta residents now have the chance to elect a mayor representative of their greatest concerns. The election is set for Nov. 7 and looks to have a lengthy ballot of candidates to succeed current Mayor Kasim Reed. From the nine candidates left campaigning, an Aug. 27 WSB-TV poll pointed out the five top runners. The poll shows Mary Norwood, former city council member, with 27 percent of the vote, Atlanta City Council President Ceasar Mitchell following with 10 percent, City Councilwoman Keisha Lance Bottoms and City Councilman Kwanza Hall tie with 9 percent of the vote and Sen. Vincent Fort garnered 8 percent. Cathy Woolard is the first woman and first gay president of the Atlanta City Council. Although she only polls 6 percent in the most recent polls, according to an 11Alive survey, Woolard has received several endorsements from prominent activist groups and LGBT civil rights organizations. “As a member of the LGBTQ community, I understand what it’s like to grow up feeling like the world isn’t made for me. I went through the same struggles, the same doubts, the same revelations that many [students] on [Georgia State’s] campus are going through now.” Woolard said. Norwood remains the only candidate with resolutions for the LGBT community featured prominently on her official campaign website. These resolutions include plans to review HIV criminalization laws, increase LGBT representation within the Atlanta Police Department, and protect LGBT youth from homelessness. As mayor, she aims to provide college students and LGBT youth with access to internships in the city government. “Board appointments, hiring practices, and mentorship programs open to all individuals. Go a long way to provide high profile persons as role models for gay youth,” she said. At an LGBT forum held on June 23, Mitchell showed his support for the community by citing his recent and outspoken criticism of North Carolina’s transgender bathroom bill, according to the Center for Civil and Human Rights. Hall recruited the first openly gay Chief of Staff, Jay Tribby, who has served with Hall for 12 years, according to the Center for Civil and Human Rights. The Councilman is committed to the LGBT community and plans to advocate for equality at the state and federal level by continuing Atlanta’s “stronger track record on LGBT issues.” However, he feels he needs more input from the LGBT community, to finalize any of his plans. “I need to hear more from LGBTQ students about issues I can help with, but I can commit to maintaining Atlanta’s 100% Human Rights Campaign Score and advocate in partnership with our LGBTQ community for equality at the state and federal level,” Hall said. At the June 23 forum on LGBT issues, Bottoms also noted the economic benefits of a more inclusive Atlanta, which attracts more special events and conventions to the city, according to the Center for Civil and Human Rights. According to the center, Bottoms emphasized Atlanta’s need to maintain an inclusive reputation apart from the rest of the state of Georgia. “‘I think that has to be a very, very clear message from the mayor at all times, that we are an inclusive city,’” Bottoms said. Fort claims a long-time, proven record of support for the LGBT community. He’s worked with the community to pass the first hate crime law in Georgia in 2000, although the law was later struck down by the Georgia Supreme Court for its ambiguity, according to NBC News. Many of the mayoral candidates have plans for increased affordable housing, or an increase in units available to Atlanta residents with incomes below the median household income, currently around $58,000 in the state of Georgia, according to Forbes. Norwood said Atlanta has the opportunity to “champion a new vision for the city” with over $3 billion dollars of public and private money set aside for the development of public transit and transportation technology. These funds are intended to increase the overall connectedness of Atlanta, as well as citizen access to community amenities over the next decade. “As mayor, my goal for transportation, transit, and infrastructure investment and expansion is to enable an Atlanta resident to walk, bike, drive, or catch light or heavy rail, to pleasantly and reliably commute from their home to their school or workplace within 30 minutes,” Norwood said. Hall has said that he plans to provide Georgia State students with affordable housing options in the Downtown area through stronger development agreements. “I made sure that when we authorized the city to sell Underground that the developer knew that the city expects affordable housing to be a part of its redevelopment. There is more potential for housing in this area,” Hall said. Other candidates, like Fort, have a stronger focus on gentrification. Fort said gentrification is a threat to both the poor and middle class. Hall has claimed gentrification as a main priority and stressed his past actions on gentrification and the need to protect legacy neighborhoods. “As many of our intown neighborhoods are experiencing much needed renovation and renewal, it is reassuring that we already have a series of ordinances and processes, including the various boards and the city’s own planning process that includes significant neighborhood and NPU participation,” Hall said. 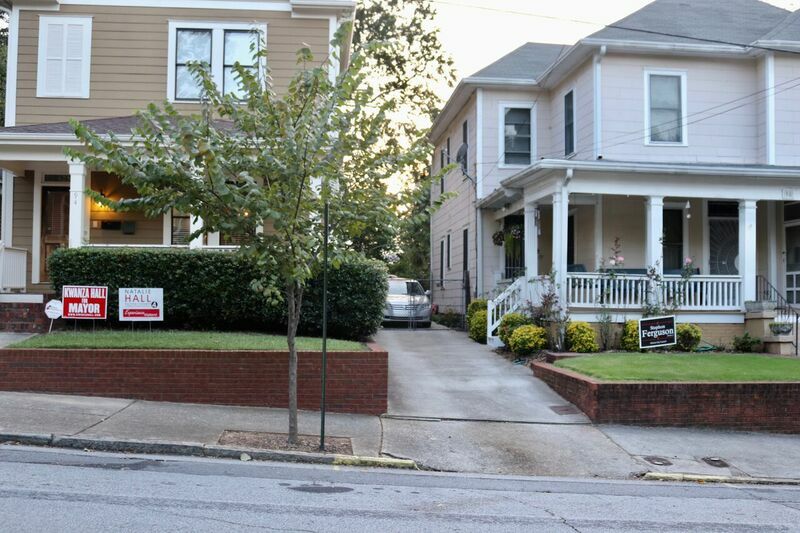 Norwood also has plans to address the issue of gentrification in Atlanta. She referenced the new Atlanta City Design that articulated the future of Atlanta and accentuates its uniqueness. “This blueprint identifies specific ways that we can be quintessentially ATLANTA – not copy someplace else – but imminently more aesthetic, connected and well-developed throughout all sectors of our city, not just those areas that have received the bulk of development over the last 40 years,” Norwood said. Keisha Lance Bottoms spoke on her past actions on gentrification that she took while serving as an Atlanta City Councilmember. Bottoms’ proposed legislation for Displacement Free Zones (DFZs) which could cap rental rates or property taxes. “While redevelopment is important for many of our underserved communities, it is equally important that we as a city establish inclusive means by which we are able to preserve the historic fabric of these neighborhoods, beginning with our residents and small business owners,” Bottoms said in the interview with Atlanta Daily World. One solution Mitchell proposes for gentrification is to require developers to set aside a certain amount of their housing to be affordable to people with low-to-moderate incomes. “Together we will implement inclusionary housing zones by requiring developers to set aside a percentage of housing that is affordable to people with low to moderate incomes,” Mitchell stated on his campaign website.